Yesterday (Tuesday) it closed at $69.75. 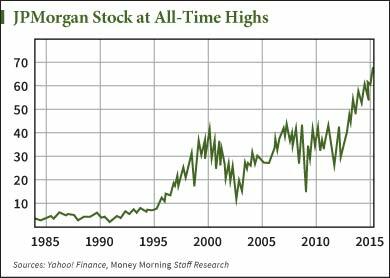 JPM stock has been on an uninterrupted march since the aftermath of the London Whale incident in 2012. That was when a JPMorgan trader made a big gamble on the credit markets and lost $6.2 billion for the firm. JPM stock dove 30% that summer – and then reversed course. Today JPMorgan has a lot going for it. And even as it continues to wrangle with legal hurdles, whether it was settling claims pertaining to its mortgage products inherited from the 2008 Bear Stearns purchase or foreign currency manipulation among its forex traders, JPMorgan seems to write lawsuits off as a cost of doing business and persists as if nothing happened. JPMorgan CEO Jamie Dimon is an easy target for anti-Wall Street sentiment, but he doesn't shy away from pointing out that the financial system is still on shaky ground, as he wrote in a 2015 letter to shareholders. "Many people think Dimon is the financial equivalent of Darth Vader," Money Morning Chief Investment Strategist Keith Fitz-Gerald said. "I believe he may be the only banker on Wall Street who fully understands the big picture." You could do worse than hitching your wagon to Dimon and JPMorgan stock. There is a hazard you take on by buying big bank stocks. "Big banks are not the bastions of stability and financial prowess many believe them to be," Fitz-Gerald said. "Big banks may harbor hidden risks." You see, the investment banking industry becomes less profitable with each day. No investment bank is going to have a blowout earnings season by facilitating buy and sell orders and shaving commission off the top. Nor is making markets a cash cow. There's too much competition in those business segments on Wall Street. The real money is exploring areas where no other investment bank would dare tread.